From the L.A. Times this weekend; "Student Debt Holds Back Many Would Be Home Buyers"
Sarah Luna wants to buy a home in up-and-coming northeast Los Angeles before it's too late. At 31, she has a master's degree and earns more than $70,000 as a court reporter and freelance editor. She daydreams about trading the Glendale apartment she shares for a little condo, maybe in Echo Park or Highland Park. Just one thing holds her back: The $700 she's paid every month since 2008, after she graduated from the University of Southern California — with $75,000 in student debt. With about half that total left to pay, buying that condo seems a long way off. "Honestly, I don't know if it'll ever happen," she said. "Barring some sort of awesome miracle, a down payment is hard to wrap my head around right now." Of the many factors holding back young home buyers — rising prices, tougher lending standards, a still-shaky job market — none looms larger than the recent explosion of college debt. The amount owed on student loans has tripled in a decade, to nearly $1.1 trillion, according to the Federal Reserve Bank of New York. People in their 20s and 30s — often the best-educated and highest-earning among them — owe most of that tab. That is keeping a crucial segment of home buyers on the sidelines, deferring one of the traditional markers of adult success. It is fairly common sense. 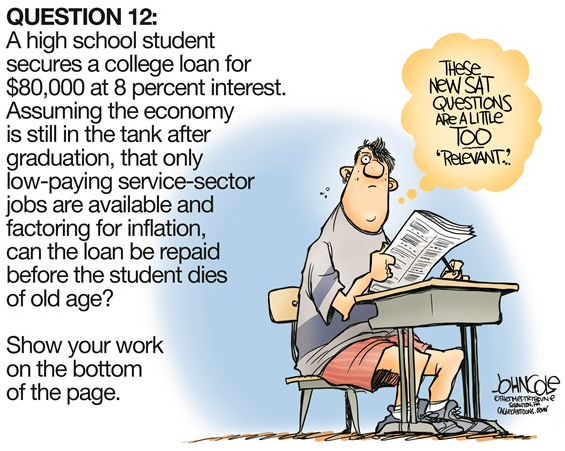 If students borrow $1.1 trillion to get through school today, that is $1.1 trillion (plus interest) less that they have in the future to purchase a home, invest, buy goods or start a business. The unlimited money offered by the U.S. government to cover tuition, housing, books, food and "other expenses" (clothes, alcohol, phones, etc. ), has been a short term back door boost to the economy that will have lasting negative impacts for years to come. "The unlimited money offered by the U.S. government to cover bankers' book holes, has been a short term back door boost to the stock market that will have lasting negative impacts for years to come"